裝甲林龍(Hylaeosaurus armatus)的模式標本NMH R3775。Credit: Sven Sachs & Jahn J. Hornung(2013). Sven Sachs, Jahn J. Hornung, (2013). Evans, David C, ed. 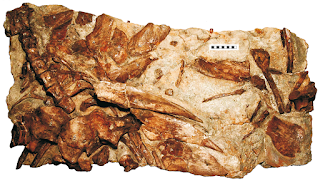 "Ankylosaur Remains from the Early Cretaceous (Valanginian) of Northwestern Germany". PLoS ONE. 8 (4): e60571. doi:10.1371/journal.pone.0060571.